One component, solvent-free, polyurethane bonding foam with exceptional adhesive strength, designated for professional use. It cures by reacting with humidity in the atmosphere, absorbs vibrations and improves soundproofing. An easy to use product that is also very easy to transport and store. In addition, its application speed is such that it saves time and money. Suitable for bonding EPS and XPS insulation boards onto building facade surfaces. It has exceptional adhesion to brick, aircrete, concrete, plaster, cement, wood and metal. It is ideal for both new construction as well as facade renovations. It participates in the external thermal insulation system for buildings, THERMOSEAL of DUROSTICK as a bonding product for polystyrene boards. 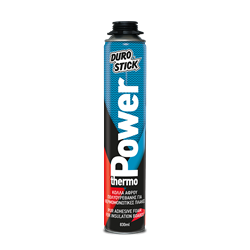 A 830ml POWER THERMO container is sufficient for bonding insulation boards on an area of 10-13m². The product is also suitable to fill the gaps between the insulation boards, where necessary, to avoid the creation of thermal bridges.